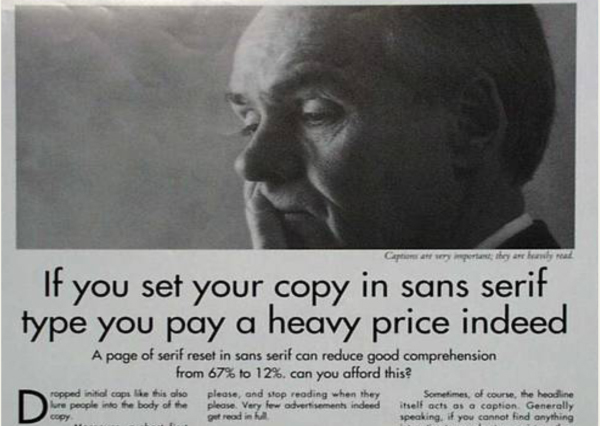 David Ogilvy commissioned and adopted excellent, deatiled, research into the effects of layout and typefaces on comprehension. The research and results are covered fully in Colin Wheildon’s book mentioned elsewhere on this website. (Colin is the man who did the research). 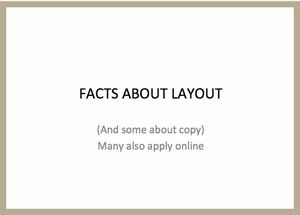 But the attached file shows exactly what he meant with examples of good and bad layouts. It’s been said that Wheildon’s conclusions may not apply to digital media, since they were all conducted in the good old days of print. To my knowledge no-one has yet done the same research on digital media. Nevertheless, I would want to have a good reason to violate these rules.